In this blog post, I will introduce you to the strategies we defined to thoroughly test the Gousto Android App and go into detail about the different approaches we use for testing the different layers of our app. I will start by giving you an overview of our architecture. The Gousto Android App architecture is based on the well known Clean Architecture by Uncle Bob. 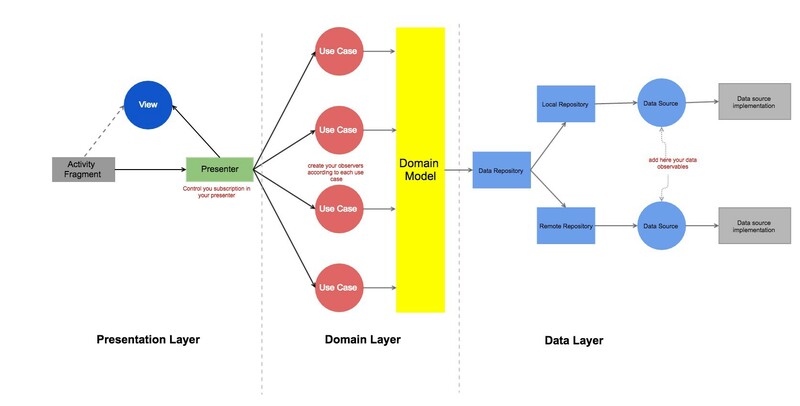 Our architecture is divided in 3 layers: Presentation, Domain and Data. In this section, I’ll describe our approach to testing different parts of the architecture. I’ll follow the framework goal - approach - coverage. The goal is what we are trying to achieve by testing a specific part of the architecture, the approach is how we decided to achieve the goal, and coverage is a brief overview of the components covered. This layer is mainly made of data source implementation and manipulation of data. Give us the right confidence in the authenticity of the calls/queries we’re making. Play a key role in describing our data manipulation rules. Therefore we need a full coverage of regression tests only. We mock the data source implementations when testing the repositories. We use functional test with different inputs in order to test the business logic in different conditions. We mock only the repositories. Presenters are components of the presentation layer that follow a specific scenario with specific command. It collects & maps the data in an easy to display & logic-free view-model and triggers the UI to render it. Describe UI behaviour and list every possible scenarios. Functional tests asserting presentation behaviour for different flows/states & commands. End-to-end UI tests covering critical flows (Signup, Order Checkout, …). Only the network client is mocked and we control the state of the app with dummy JSON responses. Unit tests are one of the way we tackle issues & crashes. TDD is the recommended way but what really matters is to have a test covering the crash to make sure it doesn’t happen again (and also release a fix for it). Unit tests are also an excellent way to deal with legacy code. There are usually 2 cases: already unit tested or not unit tested. In the presence of tests, we would just update the implementation based on the unit test expectations & assertions. In the absence of tests, we would either write the unit tests for the legacy code first based on our comprehension of the implementation, then refactor the legacy code. The Second approach would be to not touch the legacy code at all but to rewrite the code from scratch first with a TDD approach, then just replace the call, write a functional test and remove the legacy code.